Though Albert H. Munsell was an artist by trade, his passion for communicating color in an orderly fashion led to the development of early color communication devices. Munsell’s frustration with color chaos started him down the path of discovery. As an educator, he was determined to bring order to the study of color. Munsell wanted the study of color to be similar to the study of music, which had order so that one could “hear” how a composition would sound by reading the notes. Likewise, Munsell wanted one to visualize color based on its three-dimensional attributes of hue, value and chroma. 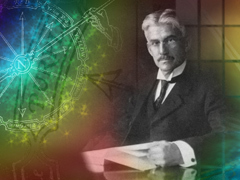 Munsell’s discovery of the three-dimensional aspect of color offered the order Munsell was looking for not only in terms of each individual color, but also each color’s relationship to other colors. Little did Munsell know that his three-dimensional color theory would become the foundation of modern day color measurement and control systems, or did he have the vision for color science concepts and methods early on? In fact, Munsell, himself, developed a primitive color device as early as 1879, while a student at the Massachusetts Normal Art School (today’s Massachusetts College of Art and Design or “MassArt”) where he studied Rood’s Modern Chromatics. He created a twirling model by placing two pyramids base-to-base, painting the tops white and the bases black with the spectral colors surrounding the faces of the pyramids, which was likely the inspiration for his patented color sphere and mount and today’s color tree. A Color Notation, A. H. Munsell, Munsell Color Company, Inc., 1971, pp. 6-7.